Achies Art Gallery stands out for its location in the quaint village of Chandor (Chandrapur), which is renowned for its historical significance as the past capital of Goa and for the presence of the Menezes-Bragança house, the Fernandes house, and a statue of the Nandi bull. The one year old gallery occupies two rooms in the beautiful ancestral house of Celio Mascarenhas. 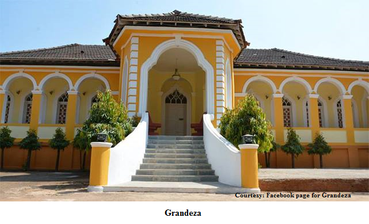 After inheriting a grand Portuguese style mansion from his father, Celio Mascarenhas decided to convert it into a venue for celebratory occasions, and hence the name Grandeza was used to advertise it as the ‘Party Palace’. Mascarenhas is an artist and a sculptor by profession and uses the media of stone and wood to express his creativity. Swetlana Cardoso’s penchant for art matches that of Celio Mascarenhas, and together they decided that an art gallery in Chandor would work owing to its historic locale and the Portuguese architecture of Grandeza. 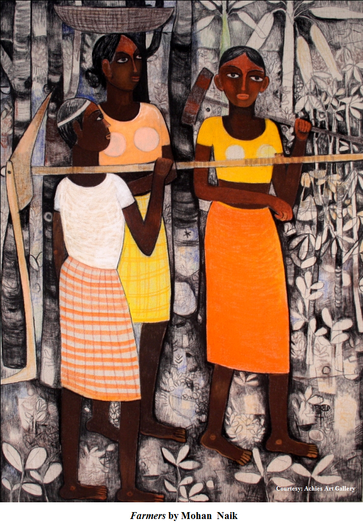 Besides, there is not much to promote art in the south, except for Majorda. Artworks, an art promotion and consultancy firm, is under Swetlana’s wing too. She delineates Artworks and Achies Art Gallery as two separate enterprises, not to be confused or integrated with each other. There is a great desire to collaborate with Goan artists where Artworks is concerned, with the prospect of managing exhibitions for them outside Goa. The spritelike Swetlana has confidence that defies her stature. She has the likes of Mohan Naik, Vasudev Shetye, Norman Tagore and Vitesh Naik displaying their art at the gallery. The theme of the first exhibition held at Achies Art Gallery was Beyond Images which had works by Mohan Naik, Harshada Kerkar, Aadhi Vishal, Fernanda D'Mello and others. The artwork presented subtly made references to the socio-political scene that prevails. The day of the opening saw plenty of sales of the paintings. Despite the distance, art lovers from North Goa and from further to the south of Goa visited the gallery. Apart from these there were viewers in large numbers from the vicinity. Achies Art Gallery has lectures, workshops and discussions on art and photography besides its art exhibitions. The gallery is set to have its second exhibition on the 23rd of January, 2016, at 7pm, entitled Life. The theme serves to be evocative of living forms, feeling or the curious mind. A combination of some artists from the previous exhibition with a few new ones will be displaying the outpourings of their creative minds. Katharina Poggendorf Kakar’s creation of fiberglass, copper, burned clay, cotton shawls, and an iron frame; titled Shrine of 7 Mothers and calligraphy by Ramona Galardi will be exhibited. Paintings by Hitesh Pankar, Mohan Naik and Harshada Kerkar are part of the exhibition too.